دامی, سینا, شیرازی, حسین, عبداله زاده بارفروش, احمد. (1395). پیش‌بینی رویدادهای اخبار بر اساس استنتاج علّی در منطق رتبه اول. مجله علمی-پژوهشی رایانش نرم و فناوری اطلاعات, 5(4), 11-25. سینا دامی; حسین شیرازی; احمد عبداله زاده بارفروش. "پیش‌بینی رویدادهای اخبار بر اساس استنتاج علّی در منطق رتبه اول". مجله علمی-پژوهشی رایانش نرم و فناوری اطلاعات, 5, 4, 1395, 11-25. دامی, سینا, شیرازی, حسین, عبداله زاده بارفروش, احمد. (1395). 'پیش‌بینی رویدادهای اخبار بر اساس استنتاج علّی در منطق رتبه اول', مجله علمی-پژوهشی رایانش نرم و فناوری اطلاعات, 5(4), pp. 11-25. دامی, سینا, شیرازی, حسین, عبداله زاده بارفروش, احمد. پیش‌بینی رویدادهای اخبار بر اساس استنتاج علّی در منطق رتبه اول. مجله علمی-پژوهشی رایانش نرم و فناوری اطلاعات, 1395; 5(4): 11-25. در این مقاله یک روش جدید برای پیش‌بینی رویدادهای اخبار در محیط‌های متنی ارائه شده است. روش پیشنهادی، از طریق تعمیم رویدادهای علت و سپس پیش‌بینی رویدادهای معلول آن با استفاده از قواعد علّی، قادر به تولید مدل پیش‌بینی رویداد است. برای این منظور، ابتدا رویدادهای موردنظر ازطریق یک مدل بازنمایی رویداد در سطح معنا از پیکره متنی اخبار استخراج شده و در قالب یک مدل گرافیکی در آنتولوژی (پایگاه شناخت) به عنوان دانش پویا ذخیره می‌شود. سپس یک سری قواعد علّی خاص حوزه پیش‌بینی در قالب منطق مرتبه اول به ماشین تزریق می‌گردد. برای مدل کردن دانش ایستا علاوه بر پایگاه قواعد، از چندین پایگاه شناخت بزرگ شامل پایگاه شناخت عمومی نظیر DBpedia، پایگاه شناخت واژگان نظیر FarsNet و پایگاه شناخت افعال نظیر VerbNet، به عنوان دانش ضمنی برای تعمیم دادن رویدادها و تولید مدل پیش‌بینی استفاده می‌شود. 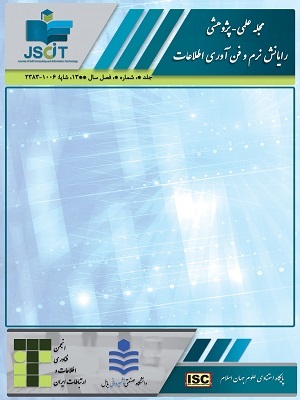 در نهایت، تمامی این مدل‌ها در قالب استاندارد زبان پایگاه شناخت وب (OWL)، به منظور انجام استنتاج علّی تجمیع می‌شوند. ارزیابی تجربی و عملی در اخبار واقعی نشان داد، که روش پیشنهادی برای پیش‌بینی اخبار عملکرد بهتری نسبت به روش‌های پایه دارد. T. Kahneman, "On the Psycology of Prediction," Psycological Review, vol. 80, pp. 237-251, 1973. M. Banko, M. J. Cafarella, S. Soderl, M. Broadhead, and O. Etzioni, "Open information extraction from the web," in Proceedings of the International Joint Conferences on Artificial Intelligence (IJCAI), 2007. A. Carlson, J. Betteridge, B. Kisiel, B. Settles, E. Hruschka, and T. Mitchell, "Toward an architecture for never-ending language learning," in Proceedings of the Association for the Advancement of Artificial Intelligence (AAAI), 2010. C. Khoo, S. Chan, and Y. Niu, "Extracting causal knowledge from a medical database using graphical patterns," in Proceedings of the Annual Meeting of the Association for Computational Linguistics (ACL), 2000, pp. 336-343. R. Girju and D. Moldovan, "Text mining for causal relations," in Proceedings of the Annual International Conference of the Florida Artificial Intelligence Research Society (FLAIRS), 2002, pp. 360-364. O. Etzioni, M. Banko, S. Soderland, and D. S. Weld, "Open information extraction from the web", Communications of the ACM - Surviving the data deluge. 2008, pp. 68-74. D. B. Lenat and R. V. Guha, Building Large Knowledge-Based Systems; Representation and Inference in the Cyc Project. Boston, MA, USA: Addison-Wesley Longman Publishing Co., Inc., 1989. M. Palmer, D. Gildea, and N. Xue, "Semantic role labeling," Synthesis Lectures on Human Language Technologies, vol. 3, pp. 1-103, 2010. D. Gildea and D. Jurafsky, "Automatic labeling of semantic roles," in Proceedings of the 38th Annual Meeting on Association for Computational Linguistics (ACL), Hong Kong, 2000, pp. 512-520. K. Radinsky, K. Svore, S. Dumais, J. Teevan, A. Bocharov, and E. Horvitz, "Modeling and predicting behavioral dynamics on the web," in Proceedings of the 21st international conference on World Wide Web, 2012, pp. 599-608. G. Amodeo, R. Blanco, and U. Brefeld, "Hybrid models for future event prediction," in Proceedings of the 20th ACM International Conference on Information and Knowledge Management (CIKM), 2011, pp. 1981-1984. S. Asur and B. A. Huberman, "Predicting the future with social media," in Proceedings of the 2010 IEEE/ WIC/ ACM International Conference on Web Intelligence and Intelligent Agent Technology (WI-IAT), 2010. R. P. Schumaker and H. Chen, "extual analysis of stock market prediction using breaking financial news: The AZFin text system," ACM Transactions on Information Systems (TOIS), vol. 27, p. 12, 2009. P. Falinouss, "Stock trend prediction using news articles: a text mining approach," Master Thesis, Department of Business Administration and Social Sciencees, Luleå University of Technology, 2007. K.-Y. Chen, L. R. Fine, and B. A. Huberman, "Predicting the Future," Information Systems Frontiers, vol. 5, pp. 47–61, 2003. D. M. Pennock, S. Lawrence, C. L. Giles, and F. A. Nielsen, "The real power of artiﬁcial markets," Science, vol. 291, pp. 987-988, 2001. B. Jansen, M. Zhang, K. Sobel, and A. Chowdury, "Twitter power: Tweets as electronic word of mouth," Journal of the American Society for Information Science and Technology, vol. 60, pp. 2169-2188, 2009. J. Leskovec, L. A. Adamic, and B. A. Huberman, "The dynamics of viral marketing," ACM Transactions on the Web (TWEB), vol. 1, pp. 1-46, 2007. I. Zukerman, D. W. Albrecht, and A. E. Nicholson, "Predicting users' requests on the WWW," presented at The 7th International Conference on User Modeling (UM99), Banff, Canada, 1999. K. Radinsky, S. Davidovich, and S. Markovitch, "Predicting the news of tomorrow using patterns in web search queries," in Web Intelligence and Intelligent Agent Technology, 2008. WI-IAT'08. IEEE/ WIC/ ACM International Conference on, 2008, pp. 363-367. J. Ginsberg, M. H. Mohebbi, R. S. Patel, L. Brammer, M. S. Smolinski, and L. Brilliant, "Detecting influenza epidemics using search engine query data," Nature, vol. 457, pp. 1012-1014, 2009. J. Durbin and S. Koopman, "Time Series Analysis by State Space Methods," Oxford University Press, 2008. K. Radinsky, S. Davidovich, and S. Markovitch, "Learning to Predict from Textual Data," Journal of Artificial Intelligence Research, vol. 45, pp. 641-684, 2012. K. Radinsky, S. Davidovich, and S. Markovitch, "Learning causality for news events prediction," in Proceedings of the 21st international conference on World Wide Web, 2012, pp. 909-918. K. Radinsky, S. Davidovich, and S. Markovitch, "Learning causality from textual data," in Proceedings of Learning by Reading for Intelligent Question Answering Conference, 2011. K. Chan and W. Lam, "Extracting causation knowledge from natural language texts," International Journal of Information Security (IJIS), vol. 20, pp. 327-358, 2005. J. Lehmann, R. Isele, M. Jakob, A. Jentzsch, D. Kontokostas, P. N. Mendes, S. Hellmann, M. Morsey, P. Kleef, S. Auer, and C. Bizer, "DBpedia – A Large-scale, Multilingual Knowledge Base Extracted from Wikipedia," Semantic Web, vol. 1, pp. 1-5, 2012. C. Bizer, T. Heath, and T. Berners-Lee, "Linked data - the story so far," International Journal on Semantic Web and Information Systems (IJSWIS), vol. 5, 2009, pp. 1-26. G. A. Miller, "WordNet: a lexical database for English", Communications of the ACM, vol. 38, pp. 39-41, 1995. K. Kipper, A. Korhonen, N. Ryant, and M. Palmer, "Extending VerbNet with novel verb classes," in Proceedings of LREC, 2006. J. Kim, Supervenience and mind: Selected philosophical essays: Cambridge University Press, 1993. R. W. Hamming, "Error Detecting and Error Correctiong Codes", Bell System Techincal Journal, vol. 29, no. 2, April 1950. I. Androutsopoulos and P. Malakasiotis, "A survey of paraphrasing and textual entailment methods," Journal of Artificial Intelligence Research (JAIR), vol. 38, pp. 135-187, 2010.